Preaction Systems deploy a method of using air to prevent the leakage or accidental release of water in its areas of protection. It typically requires 2ea. Actions to take place in order to release the flow of water. These actions usually are an open sprinkler head from a smoke detection system. 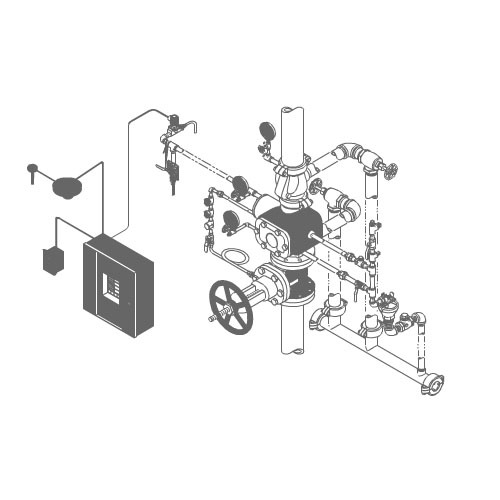 They include Tamper Switches, High and Low Pressure Switches and solenoid Valves that are monitored and triggered by a Fire alarm/ Releasing Panel. Looking for fire sprinkler systems in Dallas, Plano, Frisco, Addison, Richardson, Carrollton, Allen, Murphy, Wylie, Farmers Ranch, or Irving? Get in touch with Frontline Fire Protection, Inc.